Home gymnastics training can help your kid improve faster. What’s more, you don’t have to spend extra money for time at the gym. Gymnasts are never still and tend to transform most of the furniture within the home into training apparatus. Unfortunately, such makeshift training equipment aren’t very forgiving. 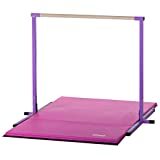 So why not get them an equipment that will help improve their gymnastic skills? One of the most popular ones to consider is gymnastics bars. This at-home training bar is great for kids who are just starting out all the way to the advanced gymnasts. Choosing the right gymnastics bar involves looking at the features and factors that count. You’ll have to match the stability, weight limit, matting requirement and height of a particular bar to your child’s needs. Furthermore, you’ll need to consider ease of assembly and the maximum skill level that will let the bar grow with your kid. Planning on buying one for your gymnast kid? Well, the following are the best gymnastics bars worth trying out. 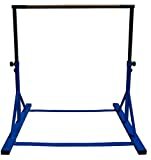 This is a heavy-duty freestanding gymnastics bar that comes stable to prevent shaking during exercise. The rail comes in a lightweight fiberglass material and measures 40mm in diameter. It’s covered in a synthetic materials that provides a firm and non-slip hold. The height of the bar adjusts from 36 inches to a maximum of 59 inches. This bar is designed to last gymnastic levels 1 to 4. It’s sturdy enough to support up to 130 pounds and stores easily indoors. This bar is designed for junior gymnasts. It comes in an improved design featuring 1-1/2-inch solid maple bar and heavy gauge steel tubing. These combine together to create one sturdy construction for kids to exercise on. Cross supports are included to keep the bar from twisting. The adjustable height of 38 to 56 inches comes in handy to grow with your kid. The bar measures 4 feet wide and fits a 4 x 8 feet mat. The corners come in a rounded design for maximum safety during practice. This bar comes in a rugged construction that remains stable without the need for bolting into the ground. It has a 52-inch rail measuring 1.5 inches in diameter. The rail is made of fiberglass and covered in wood to provide a lightweight and smooth hold that’s easy on your kid’s hands. The bar supports up to 130 pounds and can take a direct weight of 1000 pounds. Height is adjustable from 36 to 59 inches to suit gymnasts up to level 6 skills. 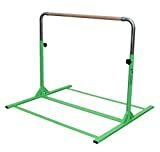 This gymnastics bar can fit a 4.2 feet wide mat. The pink accents in this gymnastics bar make it a stylish option for young girls. This is a bar that comes with something extra – a training mat measuring 8 feet long and a balance beam of the same dimension. The bar comes in solid steel with stainless steel hardware for maximum durability. Combined with a powder coating, you get a long-life construction that’s resistant to rust and corrosion. You get the convenience of a 5-position height adjustment set at 36, 42, 48, 54 and 60 inches. The set height locks in place using stainless steel screw bolts. This is another great option for your young lady though boys can also use it. 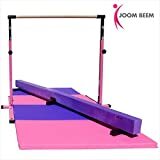 This gymnastics bar comes complete with a pink mat to add some fun to the training. The bar stands at 5 feet tall and comes with a 4 foot rail. It’s made of a lightweight yet sturdy steel tube capable of supporting up to 100 pounds. A smooth rubber coating is added to provide a more comfortable hold. This bar comes with tools and instructions for easy setup. This bar comes in form of a kit package to eliminate the need for buying individual items, something that makes it an economical choice. The kit includes an expandable junior training bar and an extension kit. The rail measures 40mm in diameter and is made of a lightweight fiberglass material covered in soft non-slip wood. This rail can hold 1000 pounds though the bar is designed to a weight limit of 130 pounds. The bar is designed for level 1 to 5 skills and you can add the extension to match the level 6 skill. 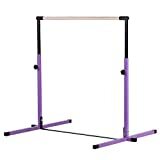 This junior gymnastics bar comes in a vibrant purple color with black and white accents. The bar is designed to adjust on the horizontal from 3 to 5 feet. The height is also adjustable and locks at the 36, 42, 48, 54 and 60-inch mark. A wide 4 feet footprint provides enough area to fit a normal landing mat measuring 4 x 8 feet. The bar comes in a wooden finish and measures 1-1/2 inches in diameter. This gymnastics bar supports users up to 100 pounds. 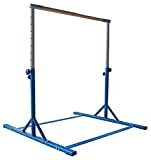 Get a quality package with this gymnastics bar. The horizontal bar stands at 4 feet high and there are lock down bolts included for easy and secure height adjustment. It comes with a landing mat that folds easy for space-saving storage. The mat measures 1-3/8 inches thick and has a firm foam padding for maximum cushioning. The cover is made of vinyl coated nylon to create a surface that’s fire retardant and resistant to mildew and punctures. This is a tough new bar with an exclusive design. This pro-deluxe bar is designed to be more stronger and study compared to most brands. It’s heavier sporting a 60-pound construction for maximum stability and support. The bar has a freestanding design covering 52 x 48 inches of space. It’s 1-1/2-inch rail has a weight limit of 100 pounds and there’s a spin lock mechanism that lets the height be adjusted from 35 to 58 inches. Additional steel bracing are included at the base for greater stability to accommodate the most aggressive drills. This bar is designed to professional standards and comes in a sturdy and visually appealing construction. The vertical tubes are made of corrosion-free and rust-resistant stainless steel for long-term durability. Welded triangular bases are fitted at the base for improved structural integrity. The rail is covered in non-slip wood made of solid oak. Height adjustment is from 3 to 5 feet done in small 5-inch intervals. Thick rubber pads are fitted on the feet to protect the floor and keep the bar from sliding.